Wintergreen Couch is the most popular choice among families when choosing a new lawn. Wintergreen Couch is best suited for full sun areas, it has a smooth, soft surface leaf and is extremely hard wearing. 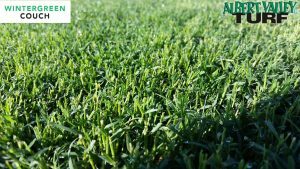 It is highly resistant to drought conditions and is not rough to the touch like some other turf varieties of couch grass. Even in the cooler months of winter, Wintergreen Couch retains its green colouring, hence the name “Wintergreen”. The only real time it goes brown is when touched by frost, but always readily bounces back with some fertilising and watering. 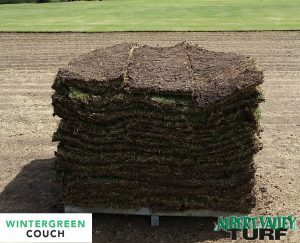 Wintergreen Couch tolerates a range of diseases and weather conditions, making it ideal for people wanting a good all rounder lawn. For a perfect manicured lush lawn it is best to mow weekly and fertilise throughout the year. Once per year from September – November it is important to de-thatch your Wintergreen lawn. 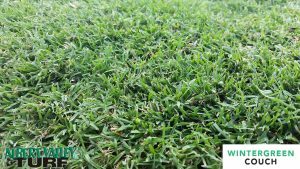 This means removing the layer of dead turfgrass tissue known as “thatch.” This residue is bad for your grass, as it keeps water and nutrients from seeping down to the grass roots. This can be done by taking your mower down to the lowest blade and mowing it at a very low height to remove the entire thatch layer. This can be done with one single mow, or may more easily be done with several passes being used – each time lowering the mowing height until all the thatch is removed. Fertilise every six to eight weeks during the growing season and water every 3-5 days in winter and every second day in summer. Albert Valley Turf has been operating for over twenty years. We also supply Sapphire Soft Leaf Buffalo, Empire Zoysia and Oz Tuff Couch. We have an experienced landscaper on-site who can assist you to make the right decision for your garden and we offer delivery and turf laying services. Visit our about us page, and be sure to contact us today to discuss your turf requirements.